Wildlife is abundant in our area. 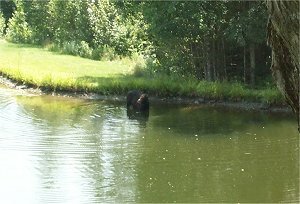 Here a moose cools off in our farm pond on a hot summer's day. Breakneck Ridge Farm is comprised of raising buffalo, making and selling hay, making and selling maple syrup, and harvesting wood. We started farming 36 years ago, and are now starting to slow down as we map out our plans for retirement. The first entity to go will be the buffalo. Although we have enjoyed raising buffalo, and solidly believe in the meat from them, raising buffalo is incumbent upon daily chores. In an effort to free ourselves for travel from time to time, we are in the process of slowly selling our herd. About half of the animals have left the farm already, and the other half are spoken for. By the fall of 2016, all the animals will be gone. We want the public to know how much we have appreciated your support in the past, we thank you for visitng the farm, and purchasing our products. We have met a lot of wonderful people and made some good friends. We plan to keep regular gift shop hours for this summer, 2015. The hours are 10 to 5 on Wednesday through Saturday during July and August. As usual, if you can't make it out during regular hours, call to see if we are home, and come on over. Breakneck Ridge Farm is owned and operated Stephen and Diana Hobart. I (Steve) was born on a small farm in East Dover, a suburb of Dover-Foxcroft, ME in 1951. My father was in construction thus the family moved around a lot. We moved to Vermont in 1965 and I went to highschool in the little town of Hinesburg where I met this little farm girl named Diana. The high school sweethearts married in 1970. Diana was born on a small dairy farm in Hinesburg and came from a long line of sugar makers. Starting with Diana's great, great Grandfather Morrell passing his sugarhouse down to great Grandfather Morrell, to Grandfather Tucker, then to her father, Cletus. As a child, Diana has fond memories of riding through town with her father and brother to go to the sugarhouse on the back farm and spend the day. Gathering the sap had moved from horse and tank to a tractor pulling a pung with a gathering tank for collecting from tree to tree. Sugaring is still in the family with Diana's brother, a cousin, and Steve & Diana all having their own sugarhouse. Technology has changed the process, we're “on line” which means using tubing, although the computer is used to inventory and for sales. Sugaring got into our blood when we moved to Maine 30 years ago for a change of pace from the life we had. We've attended workshops, Mapleramas, sugaring demonstrations, anything that will further our knowledge of what we do to produce the best product ever. Here at Breakneck Ridge Farm in Blanchard, we strive to retain traditional values mixed with modern technology. Until 1993 when Diana started teaching, one hundred percent of our income was derived from our land. We have experimented with various forestry practices on our wood lot. Stephen harvest trees in the winter, does planting and pruning in the spring, and thinning in the summer into fall. We were recognized as Maine’s Outstanding Tree Farmers of the Year in 1995 for our efforts. From February through April we are busy in the sugar bush, stretching and replacing lines, gathering, boiling and canning syrup. The farm takes center stage in the summer with buffalo births, fencing, and haying, minor construction projects, and working up firewood for next year’s sugaring. By late August, Diana is beginning another exciting school year and I am putting the farm to bed for the winter. Then he heads back into the woods for another season of harvesting. To insure that our days fly by, we spend as much time as we can with our family. We have had 5 generations within 20 minutes drive of us, the light of which is our two granddaughters. We are active in civic organizations and rarely a week goes by that we are not at one meeting for community or school. Its hard to stay home when there are so many organizations that you care for. We are open to the public on Maine Maple Sunday and during the summer we host various groups for educational tours of the farm and forest. If you’d like to join us, check our special events web page for upcoming dates. 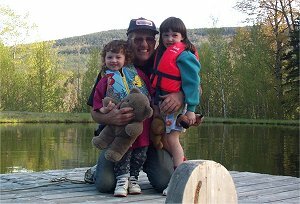 'Bamp & Babes,' Steve with his two grandchildren. Since 1987, we have processed maple syrup here on the farm for retail. The process starts in the summer with the cutting and splitting of firewood to be ready for sugaring the following spring. The sugaring season runs from about the first of March through the middle of April. The sugar house is open to the public on the 4th Sunday in March 4th Sunday in March and that preceding Saturday, but we welcome visitors any time we are boiling sap. Tasting samples are given out through out the season. This 'liquid gold' is sold in area stores and at the farm. Mail order is also an option. We carry a variety of sizes ranging from a half pint to gallons bottled in easy-to-carry plastic jugs. Now we are also featuring an assortment of glass containers that add elegance to your table. Our maple syrup is an all natural product, Nature's Pure Way. AMERICAN BUFFALO (BISON): Our farm is tucked in the hills of the beautiful Moosehead Lake Region of Maine. Approximately 60 head of American Buffalo flourish on our spacious 45 acres of pasture. Our farmed buffalo is produced with care given to the environment and good animal welfare. We can guarantee the origin, age at slaughter and continued quality of our meat. A relatively new addition to the family farm, these once almost extinct animals now number more then 300,000 head in North America. They are a wild animal, making them somewhat unpreditable. They are quite a bit larger then fallow deer and both the male and female have horns. For these reasons it is best to keep the fence between you and the animal. When bison are born, their average weight is about 30 pounds. Adult males can weigh over 2,000 pounds. …. buffalo meat is very low in fat and cholesterol yet high in protein. Buffalo meat is sweeter than beef, is not gamey and is good for you. What little fat that is found in buffalo is predominately high in polyunsaturates and essential fatty acids. Polyunsaturates are the 'good' fats that our bodies need compared to the saturated fats that can lead to health problems. There are many delicious ways to cook buffalo from stews to steaks. FEED PROGRAMS: Our animals are grass raised, they are on pasture in the summer and we feed them hay taken off our land in the winter. We do rotational grazing which gives them fresh new shoots approximately every three days. I will give them some grain just as treat, to get them to come when I want. It helps me get them into the barn and through the handling system a little easier. We are not certified organic. The reason for the lack of certification is that we have to put a little processed fertilizer on the hayfields about once every 5 years or so, whenever the soil samples show we need some help. We do this because the compost we are using is lacking a little is some of the nutrients and after a while we must add a little extra. We process our animals in a USDA inspection processing plant just down the road in Guilford. It is a small plant where the inspector is not rushed thus insuring a thorough inspection. All the meat is vacuumed packed which means a longer shelf life." Come visit our farm and tour our facilities. We do not use artifical stimulants or growth hormones. GIFT SHOP: We have our unique gift shop where you will find some neat souvenirs, maple syrup in etched glass, and buffalo meat. The shop is open for the fall and winter months nights, weekend and by appointment. In our newest barn there is 6 foot high glass panels on the second floor that overlooks the grazing bison. No need to worry about climbing stairs because the front of the barn at the second story is at ground level. There are tables and benches to sit at, to eat, or to just relax. Diana enjoys her hobby of making quilts. COME VISIT THE FARM To get to Breakneck Ridge Farm, travel north from Bangor on Rt. 15 to Monson, Maine. In Monson, as you come into town, take a sharp left onto the Blanchard Road. South from Greenville, go through Monson, about 300 feet past the Irving station, go straight onto the Blanchard Road. Drive 4 miles to the town of Blanchard and go straight through the cross roads. The farm is about one half mile on the right. A quick call will assure that someone is here to greet you and answer any questions you may have. We look forward to meeting you. When my grandparents, Paul and Ruth Hobart bought the farm, they had no intention of farming. They bought the house and 40 acres in 1953. Before they owned it, the place had been an all around family farm, a sheep farm, and later a chicken farm. There was one large barn where horses and equipment were kept on the first floor. The second and third floor was used for raising chickens. There was also another large chicken barn, a couple of large chicken coops, and probably another 10 small chicken coops scattered on the 10 acres of pastureland. The house was built in the 1800's and most of the 40 acres was cleared at this time. In 1958 and 1959, my grandparents planted the 15 acres of remaining fields with white spruce. In the 1960's they bought a 60-acre parcel on the Church Road, which did not have any common boundaries with the homestead. In 1977, Diana and I bought the Orth lot, a 140-acre parcel that lay between my grandparent's two lots, thus making one large continuous lot. This lot had a house on it that we restored and moved into. We have lived in this house for 25 years and raised our two children there. In 1979, my wife and I bought the Mitchell lot, a 750-acre lot, which was across the road from my grandparent's homestead. Breakneck Ridge is on the north side of this lot, thus the name Breakneck Ridge Farm. On this lot was a farm house and barn surrounded with about 10 acres of fields. We sold this farmhouse and barn with 22 acres. Across from my grandparent's place was an old homestead, which had burned in 1951. There were 28 acres of pasture around this homestead and another 12 acres of hay fields on the River Road. It was at this point that we decided to do some part time farming. We wanted to keep the fields open and raising Hereford beef seemed the logical solution. In 1988, we started putting up 7-foot high game fence around the pasture. By the end of November, we had 5 acres fenced with 25 fallow deer within the enclosure. The next few summers were devoted to more fencing to allow for the growth of the deer herd. In the year 2000 we cut the white spruce that Paul and Ruth planted in the late 50's. We cut the trees to bring this area back into fields as it was in 1953. Now these fields are fenced in pasture for our buffalo. As the trees were growing, we did not notice the view changing that much. Now that the trees are gone, what a spectacular view. In 2006 we replaced all the fallow deer with American Buffalo. We are enjoying the new challenges of raising the magestic American Buffalo.